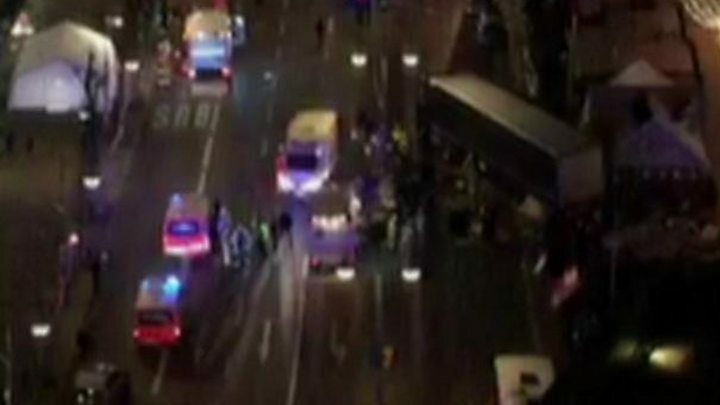 German police are investigating a "probable terrorist attack" after a man ploughed a lorry into a Christmas market in the heart of Berlin, killing 12 people and injuring 48. The driver, a Pakistani asylum seeker who entered Germany last year, is being questioned. German Chancellor Angela Merkel said it would be "particularly sickening" if he were proven to be a refugee. He was reportedly known to police for minor crimes, but not terror links. German media say police have searched a refugee shelter at a defunct Berlin airport where the suspect was believed to be staying. Interior minister Thomas de Maiziere said the man was probably from Pakistan, and that his application for asylum had not yet been processed. The suspect denies involvement, Mr de Maiziere said. "We have to assume this was a terrorist attack", Mrs Merkel said in a short statement on Tuesday. Those behind the attack would be punished "as harshly as the law allows", she added. The market is at Breitscheidplatz, close to the Kurfuerstendamm, the main shopping street in Berlin's west. The attack happened in the shadow of the Kaiser Wilhelm Memorial Church, which was damaged in a World War Two bombing raid and preserved as a symbol of peace. 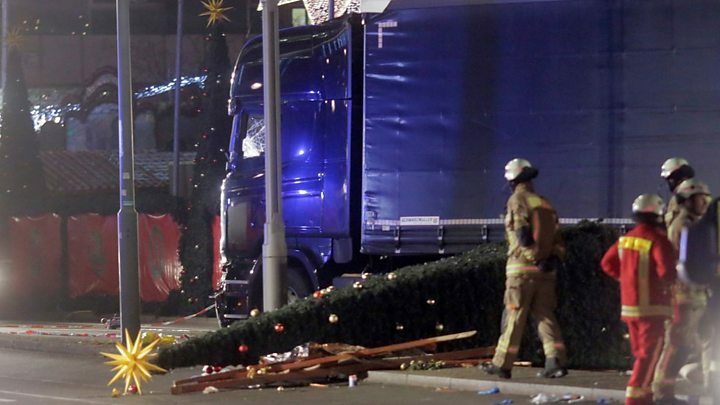 Media captionThe BBC's Jenny Hill: "What's really eerie is that the lights are still twinkling in what remains of the market"
The truck, which was loaded with steel beams, veered into the market at 20:14 local time (19:14 GMT), one of its busiest times. It crashed through wooden huts and stands packed with tourists and locals. 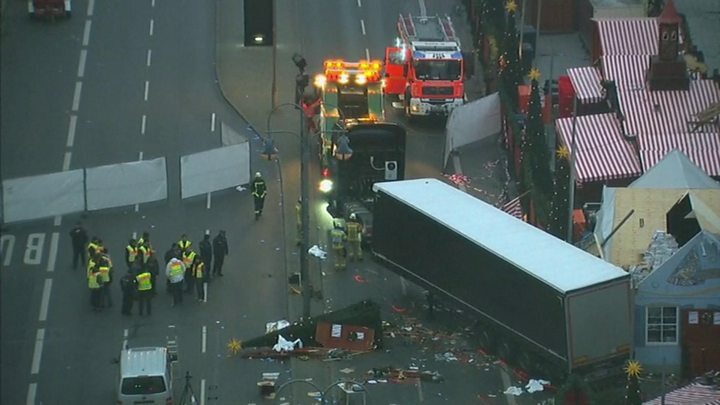 The DPA news agency said police believe the lorry drove 50-80 metres (160-260 ft) through the market area. German media have identified the suspect, citing security sources, as a 23-year-old Pakistani named Naved B who entered the country in either late 2015 or early 2016. Reports said special forces had stormed a hangar at Berlin's Tempelhof airport where they believed the suspect had been living in a shelter before the attack. Police spokesman Winfried Wenzel said he was seized after leaving the lorry and fleeing on foot for more than a mile (2km) towards the Tiergarten, a large public park. Police said a Polish man, believed to be the original driver, had been found dead on the passenger seat. "We don't know what happened to him," he told the AFP news agency. "He's my cousin, I've known him since I was a kid. I can vouch for him." The truck was registered in Poland, but it is unclear whether it was travelling from Poland or returning from Italy, as some reports suggest. Chancellor Merkel said she was "shocked and very saddened" by the attack but added "we don't want to live with fear of evil". Germany's interior ministry said Christmas markets in Berlin would remain closed on Tuesday but other markets outside of the capital will operate as normal. A senior member of Germany's anti-immigration AfD party, Marcus Pretzell, blamed Mrs Merkel for the attack, linking it to her open-door migration policy which saw the arrival of more than one million people last year. What do eyewitnesses say happened? 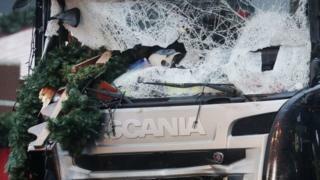 A British eyewitness, Mike Fox, told Associated Press that the 25-tonne lorry had missed him by only about three metres as it smashed through stands and knocked down a large Christmas tree. "It was definitely deliberate," said the tourist. 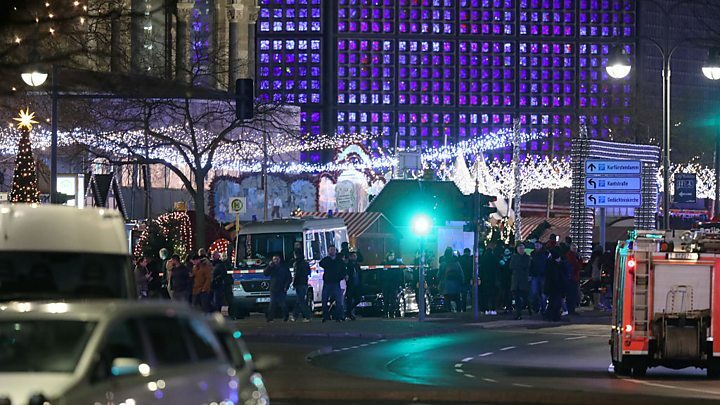 A series of small-scale attacks by Islamist militants alarmed Germany earlier this year. Ten people were killed and dozens more injured in separate gun, bomb, axe and machete attacks in Bavaria and Baden-Wuerttemberg in July. But Monday's incident was reminiscent of the lorry attack on Bastille Day crowds in the French city of Nice on 14 July, claimed by so-called Islamic State (IS). The mayor of Nice, Philippe Pradal, said the Berlin incident shared the same "blind violence" as the attack on his city. Both IS and al-Qaeda have urged their followers to use trucks as a means to attack crowds. The US labelled the tragedy an apparent "terrorist attack" and pledged its support.